In my last blog entry I discussed my own adoption of ‘digital’ technology over the years and how digital was currently going through another renaissance. However compared to the 1980’s when the adoption of digital technology was consumer driven, today it is the business world that is embracing digital. 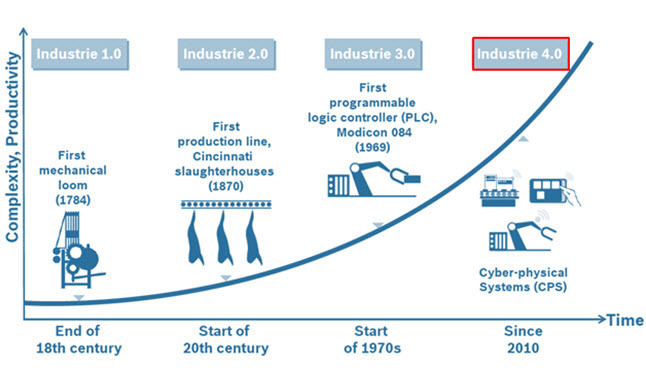 Before I discuss the future of the manufacturing digital business, especially as we enter the so called ‘fourth industrial revolution’ (or Industry 4.0 as it has become known among German manufacturers and highlighted in the above diagram from DFKI, 2011), I just wanted to use this blog entry to discuss how digital information has found its way into every department of a manufacturing operation over the past few decades. As I explained in my previous blog entry it was the design department that led the digital journey of many manufacturing companies. In the 1970s, design departments were just starting to introduce 2D Computer Aided Design (CAD) packages to try and automate manual drafting processes. Companies, mainly large manufacturers such as Ford and Boeing, were also investing heavily in mainframe computer systems to manage MRP and EDI systems. At the time, mainframe based solutions for running 2D CAD packages were expensive but they helped to speed up the design process and ensure that drawings were more accurate. Meanwhile on the shop floor, Programmable Logic Controllers (PLCs) were just starting to be introduced to help automate certain equipment used in a manufacturing process. The introduction of PLC’s and other automated handling systems heralded the start of the third industrial revolution. In the 1970’s, digital information was really confined to the design and production departments. As I discuss the next few decades I will explain how information has become more digitised and hence more ‘pervasive’ across the various departments in a manufacturing operation. Moving into the 1980’s, companies started to introduce 3D wireframe CAD models and this was really the beginning of building a stronger digital relationship between the design and production departments. The machine tool paths required to manufacture a component could be applied directly to the 3D CAD model and was subsequently used to drive Computer Numerically Controlled (CNC) machines, ie machining information is driven directly from the external surface of the 3D CAD model. In addition, robotic arms were introduced to production lines to help automate assembly procedures. Smaller mainframe servers started to be installed to support the needs of the design office and the production department started to introduce CNC machining and MRP II software on dedicated servers. As manufacturers started to embrace Just-In-Time production systems, especially in the automotive industry, purchasing departments increased the use of EDI to automate and speed up the procurement process using Value Added Networks to connect with an increasingly global network of trading partners. The 1990’s saw the use of digital information explode across the manufacturing business. Design offices were moving from 3D wireframe to 3D solid and assembly modelling. Assembly modelling managed the relationships, ie positional information, between different 3D CAD models that made up a complete product and allowed detailed Bill of Materials to be compiled. It also allowed other information to be applied to the ‘assembly tree’, for example material, designer, and supplier type of information. The 3D CAD models could be used for other pre-production activities, for example creating rapid prototyping (3D printing) models to test conceptual designs, taking CAD models into a finite element analysis package to test stress levels across a component and create high quality 3D renderings and complex animations that could be used for marketing purposes. In addition, customers could put on Virtual Reality headsets and go on virtual tours of their products. This was really the decade when the ‘Virtual Product’ was introduced, some companies defined this as Electronic Product Definition (EPD). During the mid-1990s and as the internet started to become more pervasive, manufacturers started to build intranet and extranets to support the increasing volume of digital information being produced by their design and manufacturing operations. With the introduction of higher speed networks this was the decade where digital design information started to cross seamlessly into other manufacturing departments. MRP II systems evolved into ERP systems and as manufacturers started to expand their network of plants around the world they implemented a different ERP instance to manage the production operations for each plant location. During the same period, companies started to replace mainframe based systems with smaller, desktop based UNIX workstations. During this decade the 3D digital mock-up evolved still further and companies were trying to recreate the entire product within the design system. Complete digital representations of cars, planes and ships were being developed using new functionality such as clash detection, assembly/dis-assembly animations and simulation software. In addition, comprehensive web based data management systems were being deployed to manage the ever growing volumes of CAD data and ensure that globally dispersed design teams could get access to a central repository of design information. Marketing departments were able to use digital mock-ups as part of their product launches and for developing collateral and other supporting technical documentation. Meanwhile, RFID technology was starting to be used more widely within the confines of the factory for tracking goods or pieces of equipment. The development of web portals containing digital product information meant that field support teams could get remote access to information relating to a product, for example technical drawings and other associated maintenance information. Companies also started to establish content portals for storing other information created by Microsoft related products for example. During this decade companies started to replace expensive UNIX workstations with PC workstations and high end laptop PCs. Companies were also starting to consider how a complete digital representation of a product could be archived and handed to a client. For example as well as an airplane manufacturer receiving a physical jet engine to fit to an aircraft, they would also receive a digital representation of the engine which would help with the ongoing service and maintenance of that engine for the next decade or so whilst it was in service. During this decade companies expanded their ability to share and manage information using collaborative Product Lifecycle Management (PLM) solutions. Over the last few years, manufacturers have been decentralising their design offices into countries such as China and India. This was to allow local market needs to be quickly included in product designs. For example Audi has established a design office in China so that they can develop longer wheel base cars, as Chinese consumers prefer to be driven rather than drive themselves. The introduction of high speed wireless networks helped to mobilise digital design information with the introduction of PLM focused mobile apps to review 3D designs on a tablet device for example. Even the sales teams are able to show 3D design information on a tablet device due to the availability of ‘lightweight’ 3D CAD models that can be exchanged across the internet in a relatively short time. 3D printing devices are seeing a renaissance as the price of the technology has come down considerably and it has gained wide spread consumer interest, especially during 2014, where numerous applications for 3D printed models have entered the media. Field service or maintenance teams can now access digital information through wearable devices such as Google Glass and assembly lines are seeing more humanoid style robots being deployed. For example Foxconn plans to deploy more than a million humanoid robots to support their contract manufacturing operations around the world. Finally there are drone devices, despite some early PR opportunities from Amazon and their drone based delivery service I think we are a few years away from this type of service entering the market, however drones do have a potential role to play in the service and maintenance area. From a technology point of view we are now entering the so called fourth industrial revolution where nearly every device will be connected to the internet and allow almost continuous data streams to populate in memory databases such as SAP HANA. The Internet of Things (IoT) is likely to transform the manufacturing sector over the next few years and this is an area that I discussed extensively in an earlier blog entry. Companies will start to deploy more cloud based solutions to support their operations and social media tools will start to be embraced in a more widespread manner than they have been so far. The Future, Introduction of the ‘Smart Factory’? So where do we go next?, the IoT is going to transform manufacturing operations considerably over the next decade and CIOs around the world are starting to work out how they will embrace the IoT across their respective businesses. I think we will slowly move from digital manufacturing to ‘autonomous manufacturing’. Due to the sheer amount of connected devices and hence closed loop systems that will be deployed across a manufacturing organisation, we will see ‘Smart Factories’ start to evolve. The video below from Bosch shows how advanced they are with respect to developing a smart factory concept. One thing’s for sure, the sheer volume of unstructured Big Data and Big Content that will come from IoT connected devices is going to grow exponentially over the coming years. If this information can be ‘harvested’ and analysed efficiently then quicker business decisions can be made to improve the overall efficiency of the manufacturing process. ← Say Hello to the Digital Business!, is it a Case of Going Back to the Future?